1. What is a boat dock? As per the ordinance definition, a boat dock “includes a wharf, pier, float, floating dock, island, boat dock, boat slip, boat lift, stationary platform, or other similar structure”. 2. Why do I have to register my boat dock? 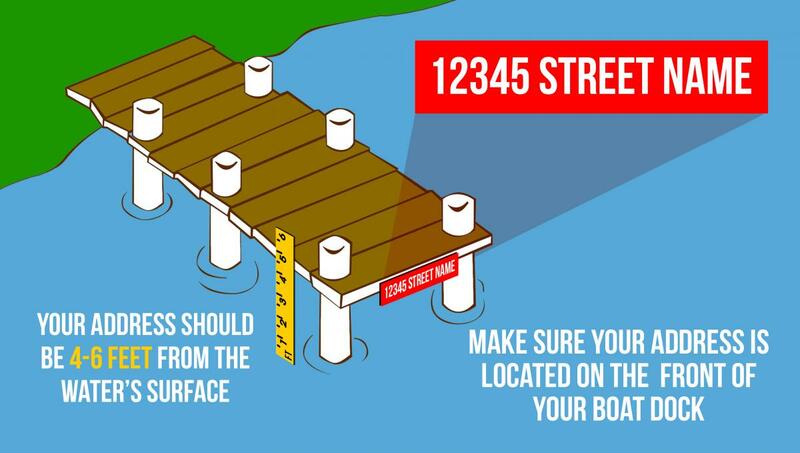 City Ordinance 20140626-113 requires you to provide proper addressing of your boat dock. This is a mandatory measure put forth by the City of Austin. 3. How do I address my boat dock? To properly address your boat dock, your address should be located on the front of your boat dock. The signage must include the street address of the primary property associated with the dock and shall be displayed 4-6 feet above normal pool elevation on the lakeward side of the dock facing centerline of the lake or slough on which it is located. The letters and numbers must be at a minimum of two inches in height and must contrast with the background they are placed on (the preferred lettering is reflective but this is left at the owner’s discretion). The tag must be constructed with materials that resist water damage and deterioration by ultraviolet light. 1. Complete the registration form found on www.austintexas.gov/boatdocks. 2. Attach current photos for proof of addressing. • Mail: Via USPS Certified Mail/Return Receipt Requested to City of Austin-Austin Code Department, Attn: Licensing and Registration, P.O. Box 1088, Austin, TX 78767. • Walk-in: The registration form may be submitted in person at Austin Code Department, 1520 Rutherford Lane, Bldg. 1, Austin, TX 78754. This is not a mailing address. Registrations mailed to this address will be returned. • Online: The form and photos may be emailed to ACDLicensing@austintexas.gov. 5. What happens after I submit my registration? After the Austin Code Department has received your registration form with current photos, the Austin Code Department Intake Office will process your application. Once received, you will be sent a confirmation notice. To get in touch with the Intake Office, please call 512-974- 9144. Hours of operation are Monday through Friday from 8:00am-3:00pm. If you do not receive anything from the Austin Code Department regarding your boat dock registration after one week, please reach out through email at ACDLicensing@austintexas.gov. If your submitted registration form is somehow incomplete or invalid, the Austin Code Department will reach out to you. There is currently no fee to register your boat dock. A Cost Analysis Study is currently being conducted. Once this report is completed, a boat dock registration fee could be implemented beginning October 1, 2019. 7. Do I need to renew my registration and if so when? Yes, you will need to renew your boat dock registration. Residential properties need to renew every 5 years (fee required). Commercial properties are required to renew every 2 years (fee required). 8. What if I have more than one boat dock at my address? For those who may have more than one boat dock structure (for definitions of boat docks see question #1) located at the same address, you will only need to address one of the structures. 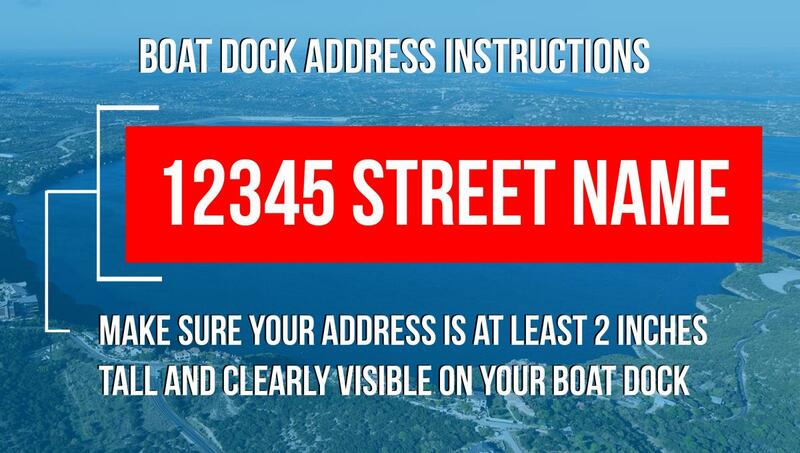 At your discretion, address your most prominent boat dock. For all other questions, please email ACDLicensing@austintexas.gov. 1. What is the Austin Code Department’s Code Connect? Code Connect is a program that allows citizens to contact the Austin Code Department and talk to an experienced facilitator who can help them with general code questions, provide resource guidance, and give updates on their existing cases. Code Connect is here to Inform – Guide – Educate! 2. What should you expect when you call Code Connect? The Code Connect Facilitator will assess your question or the situation you are presenting. Then the facilitator will assist you in getting the answer to your question or a path to resolving your situation. 3. Why should I call Code Connect? Can’t I just call the Code Inspector assigned to my case? You are always welcome to call the Code Inspector assigned to your case. However, since Code Inspectors are most often away from their desks performing field inspections, they may not be available to answer their office phone. Code Connect is staffed with facilitators who are available for the citizen to call to get an update on their case. 4. Can I call Code Connect anonymously? Yes, you can call Code Connect anonymously. However, if you are calling Code Connect about an existing complaint, we will be very limited in terms of what we can discuss with you due to legal and privacy concerns. Just as importantly, if the complaint is made anonymously to 311, these same limitations are in place. 5. What do I do if my call is outside the Code Connect hours of operation? The Code Connect line is staffed Monday through Friday from 8:00 AM until 4:00 PM. Outside of these hours, please call 311 or your assigned code inspector. You can also visit the 311 homepage for more information. 6. Can Code Connect provide specific direction on my case or tell the Code Inspector what he/she must do? 7. Who do I call about permits and plans for additions to my house, decks, and other similar questions? The City of Austin Development Services Department (DSD) is responsible for these types of questions. 8. I think I have mold growing in my house/apartment. Will the Austin Code Department address the mold? The Austin Code Department cannot address possible mold growing in your house/apartment. However, mold is often a sign of other violations that the Austin Code Department can address such as a water or wastewater leak, a leaking roof or other structural condition violations. You can hire a private company to assess the mold. You can also contact the Texas Department of State Health Services (TDSHS) at 1-800-293-0753 or get more information at http://www.dshs.state.tx.us/iaq/mold.shtm. Tenants dealing with possible mold issues can contact the Austin Tenants’ Council at 512-474-7006 for assistance. 9. Is my house/apartment required to have insulation? In most cases, yes. However, enforcement of insulation requirements is done as part of the permitting and inspections process for new construction and renovations. The Austin Code Department does not enforce insulation requirements. For more information about insulation requirements contact the Development Assistance Center (DAC) at 512-978-4000. Can a license be revoked? Yes, Austin Code may revoke a license if a licensee does not comply with the law, pay required fees or file required reports. How do I find a licensed hauler in Austin? Find a listing of licensed haulers at www.austintexas.gov/hauler or call 3-1-1. How do I get or renew a license? A completed City of Austin Application for Licensing and Exemption. How much is the recycling licensing fee? Recycling vehicles and containers are exempt from fees as long as they are used exclusively to collect recyclables and have blue recycling licenses. The license decals must be permanently affixed to the exterior vehicle doors. How much is the solid waste licensing fee? The licensing fee for solid waste vehicles is $355 per vehicle / per year. The fee is due on or before the last business day in January of each year. I collect landfill trash and/or recyclables outside the city limits (Austin) but I drive through Austin. Do I need a license? Per Ordinance No. 20120628-012, you do not need a license. The licensing requirement is for businesses, which collect landfill trash and/or recyclables in Austin. Is illegal dumping a problem in Austin? Yes, the City of Austin spends $250,000 per year cleaning property where furniture, tires and junk have been illegally dumped. What does the ordinance [Chapter 15-6, Article 3] require the City to do? To support the Universal Recycling Ordinance (URO). Learn more. What happens if I haul without a license? Offenses are punishable by a fine up to $2,000 and, upon a first conviction, not less than $100. The minimum fine shall be doubled for the second conviction of the same offense within any 24-month period and tripled for the third and subsequent convictions of the same offense within any 24-month period. Recycling is a process by which materials are collected, sorted, processed or prepared into marketable commodities for manufacturing into new products. Solid waste is rubbish, refuse and other discarded materials, such as tires and construction scraps (e.g. landfill trash or debris). Where do I turn in my application and documents? Mail your completed application and documents to City of Austin—Austin Code Department, Attn: Finance - Waste Haulers, PO Box 1088, Austin, TX 78767 or submit your completed application and documents online to ccdhaulerlicense@austintexas.gov. The original document will need to be submitted in order for your licenses to be issued. Austin Code and law enforcement will ensure private haulers operating in the city comply with this ordinance and other applicable laws. Who may I contact about licensing and reporting requirements? Please contact our Licensing Program Specialist at 512-974-9035 for information regarding licensing and reporting requirements. Why do haulers need a license? All private haulers that collect, remove, or transport waste, recycling, and/or organic/compost within the City of Austin must obtain a Private Hauler License (Ordinance No.20120628-012, City of Austin Code 15-6, Article 3). The license must be renewed annually, and is not transferable. Inspect flues and chimneys for cracks, corrosion, holes, debris or blockages. Buy fuel-powered heaters with automatic shut-off features. Fuel heaters in well-ventilated areas. Open windows periodically to air out your house. Homes with energy-efficient insulation can trap CO-polluted air inside. Use a gas stove for cooking purposes only. Operate gas-burning appliances in a well-ventilated room. Use charcoal grills outdoors, never indoors. Learn more about Carbon Monoxide Safety. What are possible sources of carbon monoxide? When a person breathes in carbon monoxide, it is absorbed by hemoglobin, the oxygen-carrying protein in the blood. "Carboxy hemoglobin" is then formed, replacing oxygen, preventing its release in the body and eventually causing suffocation. Mild Exposure: Flu-like symptoms including slight headache, nausea, vomiting and fatigue. Medium Exposure: Severe headache, drowsiness, confusion and a fast heart rate. Prolonged exposure to medium levels of carbon monoxide (CO) can result in death. Extreme Exposure: Loss of consciousness, convulsions, heart and lung failure, possible brain damage and death. While everyone is at risk for CO poisoning, unborn babies, infants and young children, senior citizens and people with heart and lung problems are at a higher risk due to their greater oxygen needs. Carbon monoxide is a colorless, odorless, extremely poisonous and explosive gas that causes 1,500 accidental deaths and more than 10,000 injuries each year. CO is slightly lighter than air and mixes throughout the atmosphere. It is a by-product of incomplete combustion, produced when fuels such as natural gas, propane, heating oil, kerosene, coal, charcoal, gasoline or wood are burned with insufficient air. What is the deadline to install a carbon monoxide detector? The ordinance goes into effect on April 1, 2018. Learn more. What should I do if the carbon monoxide alarm sounds? Leave the house immediately and call 9-1-1 or an emergency response number. Have someone contact the fire department and consult the local fuel company. Turn off all fuel-burning appliances that are possible sources of CO. Contact the local fuel company or a licensed technician to repair the problem. Where can I purchase a carbon monoxide (CO) alarm? Carbon monoxide alarms may be purchased online or at local retail stores. Where do I place the carbon monoxide alarm? In a dwelling unit, a carbon monoxide (CO) alarm must be installed outside of each separate sleeping area and in the immediate vicinity of each sleeping area. A CO alarm must be installed within a sleeping area if a fuel-burning or solid fuel appliance is located within the sleeping area, a bathroom attached to the sleeping area or a garage attached to the sleeping area. Who is responsible for installation and maintenance of carbon monoxide alarms? The property owner or property manager is responsible for the installation and maintenance of carbon monoxide detectors. Exceptions only apply to owner-occupied rentals and units regulated by another section of the code (such as hotels, motels, and bed and breakfasts). How long will I be given to register? How long will I remain on the Repeat Offender list? Registration is non-transferable. If the property is sold, the new owner will have 30 days to submit a new Repeat Offender application and pay a new registration fee (if applicable). If the rental property is made compliant within 90 days after the property is sold, the property will be taken off of the repeat offender list. What information is required on the registration application? The owner will be asked to provide his/her name, address, telephone number, and email address. If the owner is a corporation or association, the name and address of the registered agent on file with the Texas Secretary of State will be required. In addition, the number of individual rental units and buildings at the property and a telephone number that will be answered 24 hours a day by a local contact (i.e. : emergency phone number) will be required. Why am I being required to register? Received two or more separate notices of violation for conditions that are dangerous (likely to cause physical harm or injury to someone) or impair habitability (impair the quality of life for a tenant, such as problems with hot water, electrical service, heating, electrical hazard or infestation) for the same property within 12 consecutive months and failed to correct the violations within the time frame required. Received five or more separate notices of violation for conditions that are dangerous or impair habitability (as defined above) which are issued on separate days for the same property with a 12 month period regardless of whether the violation was corrected or not. Was issued two or more citation for conditions that are dangerous or impair habitability for the same property within 12 consecutive months. Will I be required to display the registration certificate? The registration certificate must be displayed at the property. In addition, signs in English and Spanish must include the emergency phone number for the property and information regarding how to report code violations. One sign for each 50 unit will need to be displayed and must be 12 inches x 24 inches and on weather-proof material. 1. How much is the Rooming/Boarding House licensing fee? The fees are based on number of sleep rooms in the establishment. They are $330 + $12 per sleep room. Fees are prorated by quarter. All fees are non-refundable. 2. What if my Rooming/Boarding House is Residentially Zoned? By law, a residentially zoned structure cannot house more than six (6) people. In 2017, a plan was put in place to allow residentially zoned properties to legally obtain Rooming/Boarding House licenses. In order to do this, a person with a disability or someone representing a person with a disability must submit a Reasonable Accommodation Request to a City of Austin employee. The RA Request form can be downloaded at http://www.austintexas.gov/rooming-and-boarding. These can be turned in directly to the City of Austin Americans with Disabilities Act (ADA) Office or to the Austin Code Department with the Operating License Application. Please see http://www.austintexas.gov/rooming-and-boarding for more information about the Rooming/Boarding House program. 3. What payment options are available for the licensing fee? 4. My tenants don’t stay for less than 30 days. Should I still use the Controller’s Office website to pay for my license? No. To use this website, you MUST set up a Tax Account with the City Controller. This means that you would have to turn in a “zero report” every quarter to prove that you do not need to pay Hotel Occupancy Taxes. Please choose another payment method. 5. What are the licensing requirements? 6. How long is the license valid for? The license is good until Dec 31 of the year of issuance. All fees for the next year’s license are due by that day. 7. Is the license transferable? The license is non-transferable. If a change of ownership occurs, the new owner must fill out a new application and submit all required paperwork and fees. 8. When do annual inspections happen? An inspector will contact you to schedule a time for an annual inspection. It does not need to occur before a license is renewed. However, if the establishment is being licensed for the first time, an inspection will need to be scheduled and passed before issuance of that first license. 9. Does this ordinance apply to correctional halfway houses, sober houses, nursing houses and similar facilities? Yes. All establishments with 7 or more unrelated individuals living in it MUST be licensed. What if my house is inspected or regulated by the state? You will still need to be licensed by the City of Austin. 1. How much is the short-term rental licensing? 2. What payment options are available for the licensing and notification fee? 3. Does proof of hotel occupancy tax apply to everyone? Yes. Every person owning, operating, managing, controlling, or collecting payment for occupancy in any hotel (or short-term rental) shall collect the Hotel Occupancy Tax from their guests for the City. 4. Where do I pay my hotel occupancy tax? You may call the City of Austin, Financial Services: Controller's Office at 512-974-2590, then press 1, or email: hotels@austintexas.gov. 6. How long is the short-term rental operating license valid for? The Short-Term Rental Operating License is for valid for 12-months from the time of approval and may be renewed on an annual basis. 7. Is my short-term rental license transferable? The Short-Term Rental Operating License is non-transferable per Ordinance #20120802-122, “a license may not be transferred and does not covey with the sale or transfer or the property”. 8. What if I don't get a license for my short-term rental? Failure to register is equivalent to operating without a license and may result in enforcement action, including citations. How big should my address be? How do I address my boat dock?